Pathankot-Mandi national highway in a pathetic state. 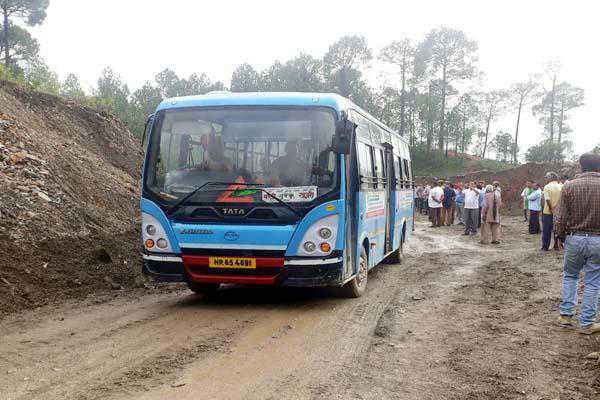 Despite the tall claims of the Thakur government, most of the state and national highways connecting Kangra district with the adjoining state of Punjab are in a bad shape. Though Chief Minister Jai Ram Thakur had set a month’’s deadline to repair all damaged state and national highways, it seems his orders are yet to be implemented or conveyed to field officers. A number of roads linking Kangra with Hamirpur, Mandi and Una districts are yet to be repaired. Around 60-km stretch of the Palampur-Hamirpur highway, which links Hamirpur with Kangra district, has become a bane for the tourists visiting the state. Another important road — Kangra Ranital to Jwalamukhi — is also in a dilapidated condition. This is one of the busiest roads as thousands of pilgrims from Punjab, Chandigarh and Haryana visit the holy shrines daily at Chintpurni, Jwalamukhi, Breheshwari and Chamunda in Kangra district. The Alampur-Jaisinghpur stretch of the state highway is also crying for attention. The condition of internal roads in Palampur, Baijnath and Jaisinghpur subdivisions is no good. Almost all internal roads are full of potholes. Most of these roads were repaired and blacktopped last summer, but these were washed away in monsoon rains because of the poor quality of the construction material used. The Himachal Pradesh Public Works Department (PWD) has even failed to serve even a single notice to the erring contractors. In the present scenario, the PWD is under scanner for the poor quality of construction. With the tourist season in the state about to begin, there is a dire need to repair these roads or it would adversely affect the footfall.